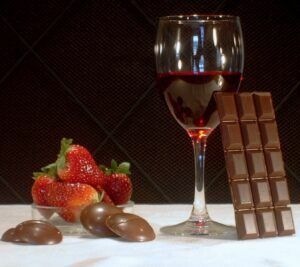 Chocolate is a natural when looking for foods that pair with wine. All you need is the right chocolate to complement the wine. Finding the right chocolate is why we created Coco du Vin™. This one-of-a-kind kit guides you through the pairing process. Inspired by our taste for great flavors we decidedly started with the wine. Using a variety of wines in many styles we tested our chocolates for pairing results. After some fine tuning and custom blending we came up with this easy-to-use pairing kit to help you experience the most from your favorite wines. Each kit is 16 pcs. and a handy wine-tasting booklet for $14.00 (+shipping). Here’s what you get…Four specially selected chocolates crafted to pair beautifully with a wide selection of wines. While we pride ourselves on our chocolates, the heart of the kit is our pairing guide designed to help even novices discover the magic and flavor explosion that comes from pairing chocolate with wine. These custom crafted chocolates bring out many flavors hidden in the wine. By following the pairing guide and matching the chocolates with the right wine, the results can be amazing. Try Coco du Vin ™ with your favorite wines and discover the new levels of flavor you’re missing.